What are these Digital Designs? 3D Artist Dizingof offers you downloadable Digital Designs (in STL format) for your 3D Printer. You can 3D print these designs on your Home, School, University, or workplace's 3D printers. You can also use a 3D printing service bureau to make them for you. 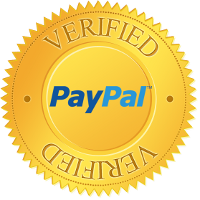 PayPal is the most trusted and secure way to pay online. You can also pay with a Credit Card. 3Dizingof.com is a Verified Seller by PayPal.com since 2010. After you pay, PayPal.com will redirect you back to a download page where you can download your design files - in a ZIP format files. Download links will also be sent to your email. How do i download Free designs? Browse the Free Designs category - Click the "FREE DOWNLOAD" button and proceed to the Checkout page. Fill in your name and email (required) then click "Download". Your download will start immediately. Yes! You get 30 days Money Back Guarantee to successfully 3D print any design. I'm a 3D Printing entrepreneur/business, can i profit from your designs? Yes, you can! Many Have! 2. A Full Commercial License: A non-exclusive, royalty free, unlimited 3D printing/Manufacturing & selling of any design. Please Contact Dizingof for more details.